The citron cockatoo is a slightly smaller, quieter, and more subdued variety of the ever-popular crested cockatoo. Its distinctive orange crest sets it apart from other subspecies, and its personality makes it a popular choice for owners who want to be needed by a pet bird and have the time to meet those needs. The citron cockatoo is also known as the citron-crested cockatoo or the Sumba cockatoo. The taxonomical name for the citron cockatoo is Cacatua sulphurea citrinocristata. This is the same species as the lesser sulfur-crested cockatoo (Cacaua sulphurea sulphurea), but the citron is smaller of the two subspecies. The two subspecies are often cross-bred in captivity, which sometimes makes identification difficult. The citron cockatoo is native to Indonesia's Lesser Sunda Islands and Sumba. The preferred habitat is tropical forests, especially on the edges of those forests. Citron cockatoos are critically endangered over this entire native range and are officially classified as an endangered species. The population decline is due both to habitat loss and illegal trapping for the pet trade. Trade of wild-born birds is now illegal, and potential buyers are encouraged to make sure the bird they buy has a CITES (Convention on International Trade in Endangered Species) certificate that proves it is a captive-bred specimen. Most citron cockatoos are between 13 and 15 inches in length, from the beak to the tip of the tail feathers. Citron cockatoos routinely live up to 50 years in captivity under ideal circumstances. 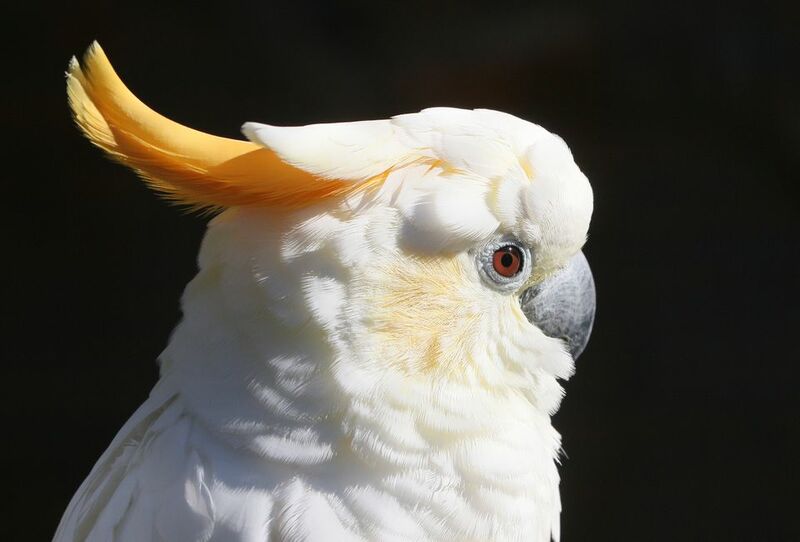 Citron cockatoos are known to be quieter than most cockatoo species, but they have big personalities and they love to play and interact with their owners. This is a slightly more withdrawn cockatoo than other varieties, and it may take a bit of time to become acclimated to new surroundings. Once established, a citron cockatoo is inquisitive and affectionate, and it will want to be by your side as often as possible. This is a bird recommended for bird owners who have plenty of free time to spend with their pet. Cockatoos, in general, need more human attention than other types of parrots, and the citron is a classic example. These birds are generally quiet by parrot standards, but they can make loud growling sounds that can suddenly escalate to very high-pitched shrieks that can be startling. Birds who become talkers are most likely to perform early in the morning. Citron cockatoos are less skilled at vocal imitation that other members of the parrot family, with learned vocabularies of no more than about 15 words and phrases. Citron cockatoos are mostly white, with pale orange patches on their cheeks, pale yellow on the undersides of their wings and tail feathers, and a bright orange crest that clearly distinguishes them from the other sulfur-crested subspecies, whose crests are yellow. The citron cockatoo has dark gray feet and grayish-black beaks. Males and females are largely identical, but males have black eyes while the female's eyes are brown. With their beautiful colors and endearing personalities, citron cockatoos are already a popular pet and are becoming more so. This is not a species commonly found in pet stores, so you will need to seek out a breeder. Before rushing out to buy one, though, potential owners should know that these are sensitive birds that require a commitment of time. If considering a citron cockatoo, first make sure you have enough spare time to spend with it. Like all cockatoos, these are very social birds, and they require a lot of human interaction in order to remain emotionally healthy. Citrons that are neglected may resort to screaming and destructive behavior very quickly. While citrons are among the smaller of the cockatoo species, these birds still need plenty of space to live in. The minimum cage size for a citron cockatoo is one with a 4 x 4-foot footprint, at least 4 feet in height. Bigger than this is even better—an aviary setting is ideal. Citron cockatoos are not a good choice for those who live in apartments or condominiums. While they are known to be quieter than other cockatoo species, these birds are still capable of loud screams and vocalizations that may offend nearby neighbors. Like all cockatoos, the citron needs plenty of time for human contact. At least 3 to 4 hours a day outside of the cage interacting with humans is recommended. If you're unable to interact with them as much as possible, some owners report that their birds appreciate having a television or radio left on—they are especially fond of music. Make sure to provide plenty of toys to chew on and shred. Like all cockatoos, citrons are prone to weight gain, so owners should monitor their fat intake. A healthy diet for a pet citron cockatoo should consist of high-quality pellets, a moderate amount of seed mix, and daily helpings of fresh bird-safe fruits and vegetables. In captivity, these birds will eat some protein in the form of cooked chicken or other meats. All parrots need exercise, and the citron cockatoo is no exception. Owners need to provide these birds with a minimum of 3 to 4 hours outside of the cage per day so that the bird can play and stretch its muscles. This time out-of-cage also provides the essential human contact the birds need. Cockatoos have strong beaks and jaws, so it's important to provide plenty of safe chew toys for them. Like other cockatoos, the citron is susceptible to psittacosis, a disease caused by the bacteria Chlamydia psitttici. A bird that shows lethargy, a discharge from the eyes, and respiratory problems may have this disease and will likely require treatment with antibiotics. Nutritional deficiencies are also common with citron cockatoos and can be prevented with a balanced diet and/or vitamin supplements. Emotional issues including destructive behaviors and feather-pulling are common in birds that aren't getting the substantial amount of human interaction and attention they require.